Everyone knows ICD-10 will redefine the coding profession, but providers and patients also will feel its power. A means to classify and track diseases and a mechanism for data collection and reimbursement, the International Classification of Diseases (ICD) has experienced many changes over the years. Way back in 1994, its 10th incarnation came into use in most of the world’s industrialized nations. However, the United States was not among those hopping on board with the new codes, instead opting to wait 20 years before joining the rest of the crowd. As the October 2014 deadline to implement ICD-10 approaches, many sectors of the healthcare industry are feeling the pinch. In the HIM world, coders likely will take the brunt of ICD-10’s force. Beyond that, expect the new codes to have a profound effect on physicians and patients. Because of the exponential growth in codes, there is concern about how physicians will adapt to the new system. Charles Sawyer, MD, assistant chief medical information officer at Geisinger Health System in Pennsylvania, explains that physicians likely will view the move to ICD-10 as something that will create additional work without any corresponding increase in reimbursement. While it will be difficult for physicians to embrace ICD-10, Robb believes by helping them understand the dynamics of the new code sets and the level of specificity required, the transition will go smoother. Also, physicians who comprehend the processes and support the necessary changes can encourage others to be more receptive to ICD-10. 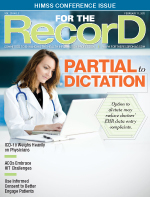 Besides having claims rejected, patients could possibly experience delays in receiving laboratory or radiology services if the referring physicians do not provide the proper ICD-10 codes. Citing the incongruity between SNOMED and ICD-10, Rothenhaus says strange medical terms could send patients into a bit of a panic. “A patient might receive a diagnosis of hip pain. In ICD-9, it is called ‘enthesopathy of hip region.’ If you don’t know what this is, it could sound a little scary. In ICD-10, the code is ‘trochanteric bursitis.’ This incongruence of terms means that patients may need a universal translator, but there is no magic decoder,” he says. Extended staff also must be part of the education process. Haas says initiatives such as hanging educational posters and creating pocket-sized informational cards are examples of tools that help raise ICD-10 awareness. “Organizational leadership must accept responsibility for the transition and know what its role is in ensuring that everyone is aware and ready,” she says. — Susan Chapman is a freelance writer and author based in Los Angeles.